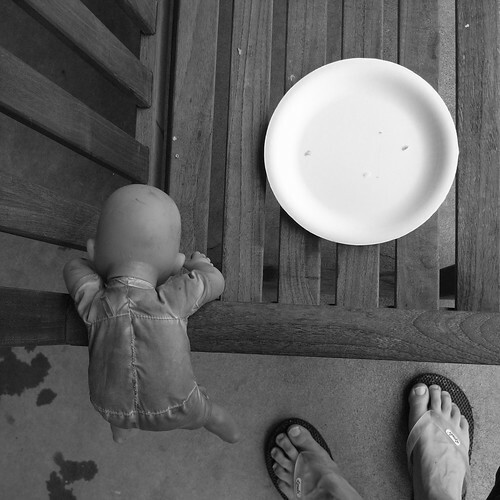 Doll, Plate, Bench, Feet, originally uploaded by Eric Jeschke. Good news on the SoFoBoMo front. Two nights ago I put the book together in Scribus. Last year Scribus was really stable for me and I was really impressed with the software. I don’t know what has happened to the software in the intervening versions since then, but this year it had a nasty bug that would cause it to crash on certain cut or paste operations. In any case, using careful and frequent saves I managed to finish the book, minus about a dozen pictures, which I had yet to take. Yesterday I got all but two of those pictures. This morning I got one more, which leaves me with one final photo to take tomorrow sometime. Then it’s just drop into the last photo frame and generate the PDF. Looking forward to getting it out there and taking a look at some of the other books that have been finished.